I recently booked a flight to Germany on Etihad Airways. I have been reading their FAQ and I am a little confused about their baggage policy. This is what is stated on their website: Can someone help me understand this. I booked the ticket under Economy (not Economy Flex) so I am allowed to carry 30kg. Is there a limit on the number of bags that I can carry?. 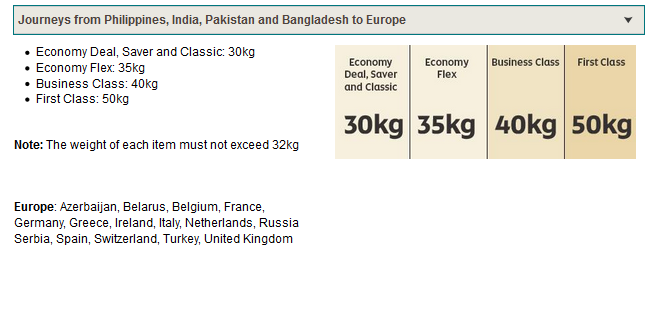 Or does the combined weight of all bags must be 30kg?. I assume you bought your tickets after 31-1-2018, if so, the limits on this site are what you need to work with. As you can see, it has different limits based on different destinations, that is size limits, and there are number limits depending on where you fly to. Most of the exceptions have a lower level of 2 bags up to 23 kg each, but they mostly do not show the Economy fare you mentioned. I guess the information you found is older, there were new rules in 2018 but also in 2015, and the rules seem to go toward one bag with a maximum of 23 kg. Not the answer you're looking for? Browse other questions tagged luggage etihad or ask your own question.